Find out "What type of Singaporean you are?" 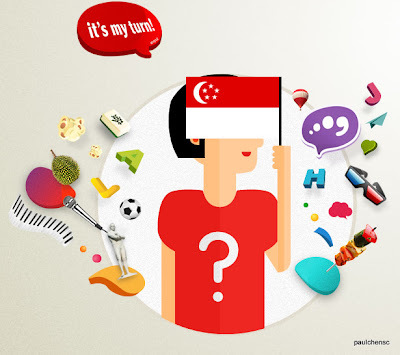 - "It's My Turn"
"It's My Turn" is a simple online quiz that analyses your personality to find out "What kind of Singaporean you are?" There are different personalities and you can choose to retake if you think that the resulting personality does not describe you well. 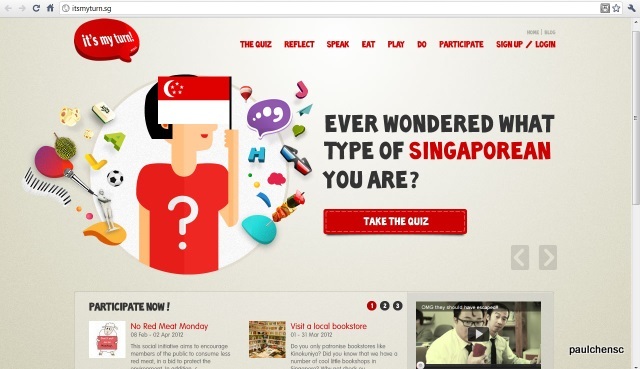 Ever Wondered What Type of Singaporean You Are? Find out which personality you are. This year's Total Defence (TD) campaign, themed "Total Defence: It's My Turn", seeks to convey the message that it is now our turn to play our part for TD and build on what other Singaporeans have done to keep Singapore strong and secure. 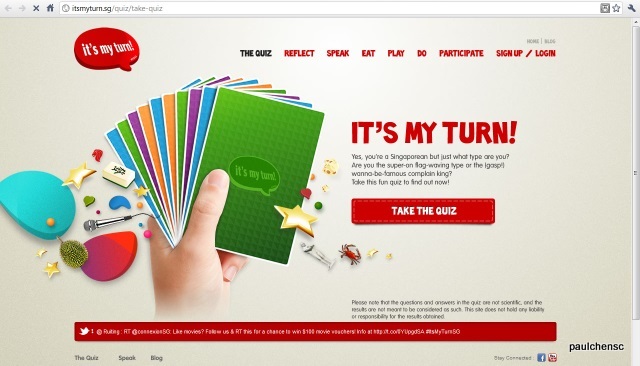 The campaign is centred on getting Singaporeans to do two things: "Appreciate" and "Participate". - "Appreciate": To prompt Singaporeans to appreciate how TD has been instrumental in safeguarding our way of life through understanding our history, culture and identity. - "Participate": To encourage Singaporeans to step forward to do something meaningful for the community, be it reaching out to those in need and/or strengthening the community that we live in. These can range from simple actions such as inviting your neighbours for a meal to larger efforts like raising funds for a worthy cause. We have to go through 10 stations, and here are 2 of the 10 stations: Phoenix Medical Group and Paradise Inn. Station 8 Clue: There are Chinese mystical creatures in our logo. Learn and Pose: Team members are to ask questions and learn more about the products or services offered + take a photo of themselves with the products/ services or with staff. - Find out about the skin care products and identify the best seller and why. Our task is to find out the best selling skin care product, and one of us is to undergo the facial wash. I was the chosen one for this task. Me before the facial wash.
Me during the facial wash.
Me after the facial wash. I looked so white! Superb and refreshing! Do contact Phoenix Medical Group for more details. Station 9 Clue: We served 8 traditional double-boiled soup. Simple and charming with authentic yet affordable food, inns are an integral part of Chinese folk life. Paradise Inn take this traditional concept of a Chinese inn and bring it to a new level of sophistication with a contemporary Oriental ambience replete with little details like red cushions adorning stools and traditional Chinese lanterns. Eat and Pose: Team members to eat up all the food items served + take a photo of themselves enjoying the food or a photo of the food served. - Double boiled soup, floral herb-infused hot tea, stewed ‘dong-po’ pork, crisp-fried crystal prawn with salted egg yolk. Enjoying her delicious Supreme Seafood Fried Rice. Do visit these stores when you are at Greenwich V! Vote for The Lifestyle Team at http://blog.omy.sg/greenwich-v/vote-win/, and stand to win attractive shopping vouchers at Greenwich V mall! Voting begins on 13 March 2012. 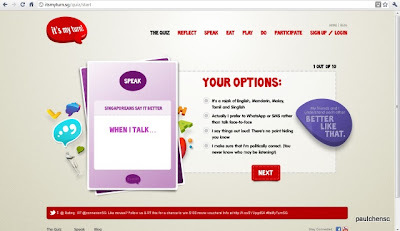 "The Greenwich V Experience @ Seletar Hills" uploaded by omysingapore on Feb 22, 2012.
greenwich V | Live. Life. Better. Did you see a group of people running around at Greenwich V on 11 February 2012, Saturday afternoon? It's "The Greenwich V Experience". There were 3 teams, with 5 bloggers in each team, competing in an “amazing race” style challenge. The 3 teams are: 1. Village Team, 2. Lifestyle Team and 3. Urban Team. I belong to the Lifestyle Team! Our team consist of Andy, Klessis, Phoebe, Sandra and myself. Greenwich V is a new mall operated by the Far East group. Nestled within the lush leafy surroundings of the established landed residential estate of Seletar Hills, the undulating site has a serene and charming quality that is rare in urban Singapore. It combines relaxed style, natural chic and a charming village-like ambience with a buzzing and unique outdoor concept to totally transform traditional expectations of lifestyle and shopping. Designed to be a retail and lifestyle hub with alfresco dining and casual outdoor spaces, you will discover a vibrant blend of F&B concepts, lifestyle stores, retail shops and services, including a supermarket and food court. Greenwich V is a relaxed and quaint village-like mall offering tantalising F&B choices ranging from Paradise Inn, The Coffee Bean, Cedele, Rakuichi Japanese Restaurant, Toastbox and BBQ Chicken to grocery shopping at Cold Storage supermarket and services including Guardian Pharmacy, 7-Eleven, Video Ezy, medical clinic, children enrichment schools and a pet grooming shop. 2.00pm – Briefing at Empire State: All teams were assembled at Empire State for a briefing of the game rules and blogging requirement by omy.sg; followed by an introduction of Greenwich V by Far East. Following which, an enormous spread of food was served at Empire State. Enjoying the Empire State Burger. 3.00pm – The teams assembled at the stage area for emcee to flag off the Bloggers Race. The 3 teams are tasked to complete 10 stations at mall tenants of Greenwich V, which consist of Food and Beverage, Retail, Health and Wellness and services types. Station 1 Clue: Our products are 100% fat free! Station 2 Clue: We are known for our Carrot Walnut cake. Station 3 Clue: We have 40 outlets in Singapore – the one here being our 40th. Don't Cha wish you had a Gong Cha like me? Don't Cha? Station 4 Clue: We are a winner of the Singapore Prestige Brand Award in 2009. Station 5 Clue: We are a handyman’s fantasy comes true. Station 6 Clue: We are the longest-running Singapore food franchise. All waiting for the delicious waffles! Station 7 Clue: We are the largest privately-owned, family-run coffee and tea companies in the world. Station 10 Clue: We cut and we trim. Klessis with Elly, Soulworks' most popular stylist. 5.30pm – After completing the 10 stations, we went back to Empire State to upload the photos onto Greenwich V Facebook. The most important task was to take representative pictures at the shops we visited, and each team are to submit 11 photos with captions onto Greenwich V’s Facebook page. The kids' version of heaven on earth... plus healthy to boot! 6.00pm – Each one of us was given a goodie bag. After the judges' delibration, the winners were announced on stage. The Village Team took the top prize, while we got 2nd. Bus 70, 70M, 103, 854 (67049: after Jalan Redop). 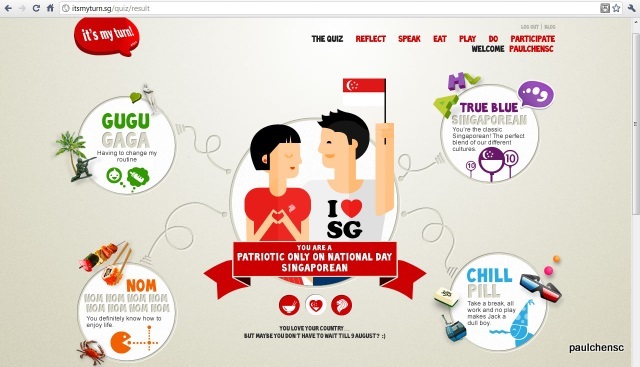 Chingay 2012 – A Waterway Parade of Love and Care. when: 3 Feb 2012 (Fri). "Man is not on earth solely for his own happiness. Show your Love, Care and Kindness everywhere!